As you’ve no doubt guessed, the craziness of the past few weeks has wreaked havoc on my schedule. So while Dan and Chris’ story still is coming, it’s not coming April 29. Breaking news, a generally high level of work insanity and a nasty cold have all combined to throw my writing schedule completely off track. I’m hoping to have an update by mid-week with a new release date. A few of the profiles have been posted here at various points in the Exeter Ledger section of the site, but most are new to this book. You’ll learn more about characters you’ve met and discover some characters that haven’t yet appeared in the books. If you’ve read it, please let me know which character you most enjoyed reading about, and which one you would love to know more about (if you had to pick just one). Giveaway ends March 19, 2013. Thanks to a kick in the pants from James Scott Bell in today’s Kill Zone, I went back through some of my Exeter short stories in progress and realized I was a lot further along than I thought with a short story/novella about Dan and Chris when they first meet. I added another 2,500+ words today to the story, and I’m hoping to have a rough draft done by Wednesday for Kyrie and Maggie to look at. (For new readers, Kyrie’s my editor and Maggie’s the other half of my critique group.) My goal is to release the story as an ebook only within the next month. If you prefer paperback, you’ll get your chance down the line. Both shorts I’m working on this month eventually will appear in the next Stories From Exeter collection: The Way We Were. If you’ve finished All That Is Necessary and cursed the ending (I’ve heard from a few of you already, obviously), you’ll be glad to know that my travel time to Indy this week was mostly spent brainstorming how the various threads of the plots will fit together. I even surprised myself by finding out a piece of information about one character I had only partially known. 🙂 Whether you’ll find out that information in Book 2 or not is still an open question. It’s either a Book 2 or a Book 4 reveal, depending on where it has the most impact. A couple of characters from the first Stories From Exeter collection who skipped All That Is Necessary reappear in Book 2, and we’ll get more information about that reveal at the end of ATIN as the story plays out. (If you were surprised by the revelation at the end the first time you read ATIN, keep an eye out for the hints you missed when you re-read. You might even pick up on some clues about what could be coming in the next book. Just a reminder: I’ll be signing books and hopefully meeting lots of new Exeter readers at Sacred Circle in downtown Staunton on Saturday morning from 10 a.m. to noon. If you live close enough to the Valley to make the trip, please come by. Carey has a wonderful store and we’ll have plenty of both of my books available. If you need extra incentive, Historic Staunton Foundation has its Winter Wine Festival just around the corner in the Stonewall Jackson Hotel from noon to 6 p.m. for just $20 ($15 in advance). The official release date is still a couple weeks away, but you can now order All That Is Necessary in paperback! 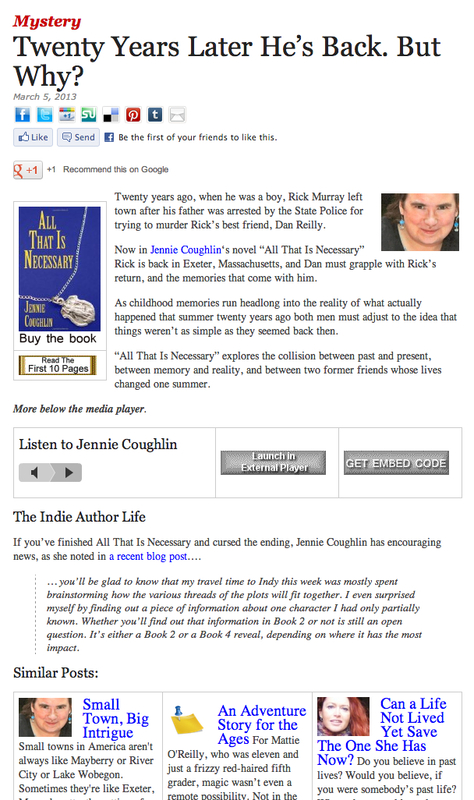 Twenty years ago, Rick Murray left town after his father was arrested by the State Police for trying to murder Rick’s best friend, Dan Reilly. Now Rick is back in Exeter. Dan must grapple with Rick’s return and the memories that come with him. As childhood memories run headlong into the reality of what happened that summer, both men must adjust to the idea that things weren’t as simple as they seemed back then. 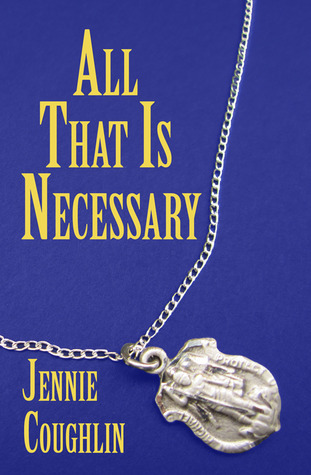 All That Is Necessary explores the collision between past and present, between memory and reality, and between two former friends whose lives changed one summer more than twenty years ago.